Gale Na Nalage Oi Las." The festive season is arriving in Assam and after harvesting Kharif crops the ‘Magh Bihu’ or ‘Bhogali Bihu’ is going to celebrate during mid-January. The ‘Lalilang’ songs and dance perform during this festival are an innate ethnic anatomy of culture and tradition of Dimoria. At present Dimoria falls under the jurisdiction of Kamrup (Metro) district, Assam, outskirt of Guwahati city. The entire Dimoria area is full of beauties with green hills and diverse eco-systems like rivers and beels. It is stated that from long back Dimoria area is inhabitat by ethnic communities like Bodo, Lalung, Mikir, Kosh, Garo, etc. However, including the non-tribals like Assamese, Bangali and also the tea tribes like Munda, Chautal, Kauri, Kurrung and Haria– all they comprise the present demography of Dimoria and living together in brotherhood. Anthropological researchers, hence, may find Dimoria a place as living museum to study important aspects of material culture of human civilisation. Lalilang is to be said as a kind of popular folk song, raw Bihu song, of Dimoria prevailing from ancient times. 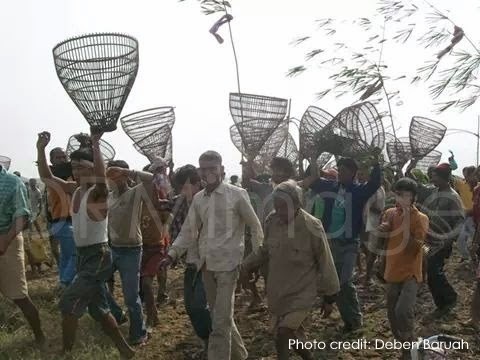 If we see the tradition of Lalilang is related to community fishing on the day of ‘Uruka’ of ‘Magh Bihu’where the King of Dimoria or representative of the King still declares open of community fishing after performing short customary ritual at the fishing beels like Parxali, Jalixora and Bomani. Before such ritual fishing is now allowed. Lalilang is also sung for merrymaking at ‘Bhela Ghar’. Traditionally, the King of Dimoria is escorted by the dancing troupes of Lalilang from villages like Bherakuchi, Bahtola, Bamfor and Kulajari to Parxali beel. 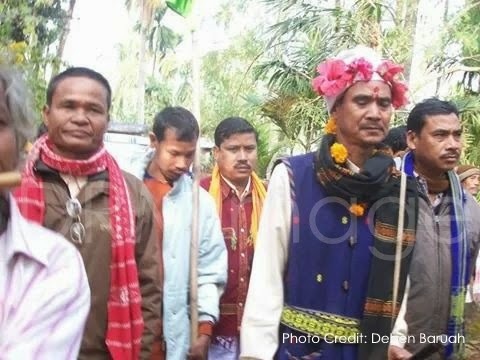 Likewise, the King of Tentelia (Telelia) is escorted to the bank of Bomani beel by the dancing troupes from villages like Lotabori, Rojakhat and Kotowjhari. On the other hand, a leader of Lalilang troupes from villages like Deulguri, Senabor, Bhoragaon and Nowagaon is selected by the King of Dimoria to declare fishing at Jalixora beel. On the bank of Parxali beel the historic Parxali Mela is held every year where the ancient barter trade system still practices. The well known Junbeel Mela of Morigaon district is held generally after one week of Parxali Mela of Dimoria under Kamrup (Metro) district of Assam. The date of Junbeel Mela is subject to announcement of the King of Gobha. The King of Dimoria Shri Holi Sing Ronghang attends in the Parxali Mela on the day of ‘Uruka’ morning and declares open of community fishing on Parxali beel. Two days before ‘Uruka’ the barter trade starts where different community people living in hills and plains meet on the bank of Parxali beel to exchange each other’s commodities. Lalilang is a kind of folk song indicative of open sensual expression which is still very natural among men and women; however, there is no any indecency in singing Lalilang, yet Lalilang is still unadulterated, but acceptably a colour of celebrating the ‘Magh Bihu’ festival in Dimoria and generally people feel shy to sing Lalilang exactly at home or in decent public programme. Further, the folklore researchers state that Lalilang would be similar with the folk songs prevail in some parts of Assam, such as, ‘Nalengi’ or ‘Naileni’ songs of Darrang, ‘Aghaitong’ of Sivasagar and ‘Lakhor Geet’ of Rabha people. Significantly these verbal arts need proper collection and preservation for future researches and in this regard, an enthusiastic folklore researcher of Dimoria who has already published a book ‘Pachkuri Lalilang’, a compilation of one hundred Lalilang songs, Shri Muralidhar Das is actively working in folklore research. Wishing you all a very happy and prosperous new year 2015, we are delighted to release Dimorian Review e-Magazine, Vol-2, Issue-1; January-February, 2015 which is consisted of some invaluable articles and beautiful poems of different writers. We are thankful to all the writers for giving us the opportunity to publish and also thankful to all well wishers, readers for their good wishes, advices, support and cooperation in making our efforts possible. The esteemed authors those who have given the shape of this issue are: Dr. Giri Kanta Goswami, Shri Atul Chandra Kakoti, Ms. Archana Konwar, Ms. Madhusmita Kalita Pathak, Dr. Yogesh Kumar Sharma, Dr. Anil Kumar Boro, Dr. Jyotirekha Hazarika, Pijush Kanti Deb, Ranjit Gogoi, Dr. Sudipta Dipak Baruah. We are indebted to Shri Deben Baruah for providing us the Lalilang photographs. Hope readers will like this issue. Once again wish you all a very Happy New Year 2015 and Happy Bhogali Bihu!